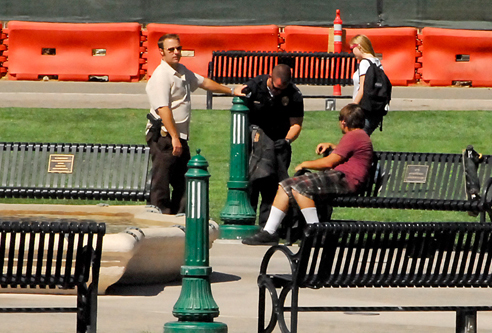 Atascadero police are routinely rooting through backpacks and belongings of youngsters in the city park, often without permission, in what officials describe as an attempt to staunch gang and criminal activity. A parent who witnessed officers’ contact with juveniles and other people in the park last week said the searches appeared to be random, and often involved young teenagers from the nearby Atascadero Junior High School campus. 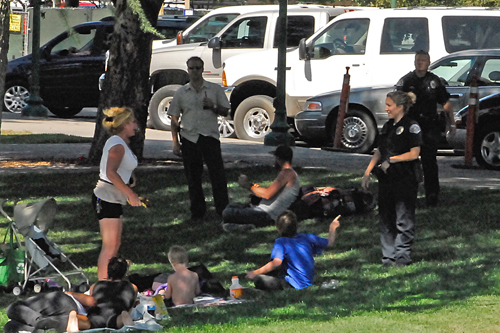 Plainclothes and uniformed officers also approached, questioned, and searched picnickers and others in the park, and rousted a few homeless from a nearby creek. CalCoastNews obtained photographs of some of the police actions, but Atascadero police officials declined to identify any of the officers in the photos. “What would have happened to this juvenile if he walked away from the police or refused to let them search his backpack?” asked Koory, the 2009-2011 San Luis Obispo County Trial Lawyer of the Year. Koory suggested there are different levels of contact between police and citizens in a public place. One type is consensual, and another type is a detention. Meyer contends the officers “always” get permission from subjects of field searches if there is no apparent reasonable suspicion. “But if we get information that drugs might be involved, or a weapon, we do not need permission,” Meyer said. Attorney Koory said that such “permission” granted by minors under duress might be inadequate. Meyer said he shares concerns about the legality of officer searches. “If what you are saying is true, then I have a problem with that,” he said. “I am very concerned about it, and it is something I need to investigate. If we have rogue cops, then we will deal with it.” But he said he would need a formal complaint from a parent to proceed. As a resident of Atascadero, I feel I have a vested interest in the activities at the Sunken Garden. I fully appreciate the presence of APD there. The Sunken Garden is a lovely park centrally located between the Jr. High and High School. It is also very closely located to the homeless shelter in Atascadero. The Sunken Garden has been taken over by an element of young adults for the past few years that is at the very least questionable in character. Our children have to pass by this area to and from school everyday. If you ask your child if there is a drug presence at school and where it can be found they will tell you the Sunken Garden. The residents of Atascadero are trying to “take back” our park and with the help of the APD we are starting to make progress. Movies in the Park during summer is one of those activities that can be enjoyed by families. Unless you have an interest in our community, I would suggest you MYOB and not worry about us poor old “mud boggers” in Atascadero we actually like to have our community safe. If what you say is the truth, then the police need to step up their presence in this area. However, the Constitution is not to be suspended on this account, is it? and who is suggesting it should be? i would submit this article gives a very narrow view of what actually took place in the sunken garden on that day and i would also say that as an eyewitness, the police had ample reason to be there. A NUMBER of commentators here have expressed their approval of this police law breaking. Go back and read what they have written. What would you have the city do, declare a “Constitution Free Zone,” like a “Gun Free Zone”? All the police need to do is establish a greater presence in the area, keep it under surveillance, and that will take care of it. Or, if that does not, the police will surely get the probable cause that they need to act because they have SEEN what is going on. THE LAW….that just makes them an idiot for making a comment like that & it makes anyone taking their word for it (that this is indeed what happened) even more lame! Not sure if you were speaking of me or not, but I do not approve of the police violating the law or the elements of the Constitution or the Bill of Rights. From the photos and the story, there is nothing to be determined. I explained how the officers could have reasonable suspicion or consent to search, If you don’t like pool little Johnny being questioned or looked at then #1 don’t have him appear to be a problem #2 don’t have him go there. End of story. No violation of anyone’s rights. You lost us @ ROCHESTER CITY EMPLOYEE……. I happen to know each officer in this picture all whom make mountains into mole hills. I still can not believe Kelly is a Police Officer what a joke Atascadero is by having such worthless human beings on its task force. Whatever poser. I happen to not know any of them personally and think that you have an axe to grind and don’t know what the hell your talking about. Let’s be clear, they have time to help keep the park clean and safe. They are not LA Sheriff’s deputies and yeah, they can be a little excitable. But overall, they are a good group of people that are doing the best job that they can and I believe following the law. Looks like someone is still upset about their last arrest. If you’ve got good “beat cops” out shaking up the kids you’d better thank your lucky stars rather than complaining over it. Most of these rascals will benefit from it down the road into adulthood and if they’re clean they’re clean. Otherwise they need to cruise on out of that cops park because he obviously has taken a quick dislike for you. On the other hand, play some frisbee, shoot some hoops, throw a football and see how little attraction you gather. Better yet, crack those school books out and be doing your homework. Parks aren’t built for teenaged wanna be’s to hang out in. Unfortunately we live in an increasingly dangerous world. I applaud the police for trying to prevent crime rather than just waiting to clean up the mess after the crime. If a crime occurs at sunken gardens based on drugs or weapons hidden in a backpack, the people will complain that the police aren’t doing their job! Come on, really?? This Defense Attorney can tell by a mere photo that this was an illegal search? That is a complete joke. He has no idea what was said, if the person consented, nothing. Plus, you have a “parent” that witnessed the searches. Did she say what was said, did she even hear? Koory is also pushing the Defense Attorney angle that a juvenile’s consent “under duress” may not be adequate considering his/her age. That is a huge stretch and Koory knows it. What duress? The Police presence?? That is not duress. Once again an article that has ZERO foundation, no witnesses, and a Defense Attorney that was not there and is making a judgement from a still photograph. Ridiculous article. I like how all of the bloggers are now up in arms about this when there are zero facts to support illegal searches. Since cal Coast was taking photos, why not contact a kid after and asked what happened and what was said?? Most parents teach their children to respect and obey authorities, especially police officers. Imagine that you are thirteen or fourteen years old, you are out sitting in the park, minding your own business when you are approached by a uniformed police officer and a plainclothes officer wearing his sidearm on his hip, exposed for all to see; wouldn’t you be intimidated? You are asked if the police officer can search your backpack; you know you don’t have anything illegal in there and you don’t want “to cause any problems” so you give your consent for the pack to be searched. Is that truly the same as consenting of your own free will when you feel intimidated? As an adult, if I was ever asked if my personal possessions could be searched for whatever reason the officer gave, I would “know” my legal rights and decline the request, but a teenager that feels if he says no that he is going to either have or be a problem is going to agree under duress. The agreement (the consent of the minor) should not be legal due to the possibility of duress; if a minor is arrested, are they able to be questioned without their parents permission? The agreement (the consent of the minor) should not be legal due to the possibility of duress; if a minor is arrested, are they able to be questioned without their parents permission? So to you duress is because they were scared or intimidated? Then can’t adults use the same out? Guess what, minors CAN consent and the CAN say NO. It is called free will. And, minors that are arrested CAN be questioned without their parents being present. They do not have that right. Belive me, almost all “kids” know their rights just like adults. It all boils down to if you are not doing anything wrong, then you do not have anything to worry about. WOW. Sounds like someone needs a refresher course in the U.S. Constitution, especially the 4th Amendment. Shame, SHAME on you RU4Real! no paso, shame on the parents that leave their kids down at the park knowing full well what’s going on down there. paso, these kids are being searched because they are associating themselves with a known bad crowd. not just on the whim of some officer on a power trip. the police come down to the garden because we call them down there. to be clear, i’m in NO WAY advocating for the police to infringe on anyone’s rights. as an eyewitness to the event referenced in the article, i’m certain the police had good reason to be there that day. i do have to say, it’s truly baffling to me that as a parent you’re willing to make this about constitutional rights instead of what, in my opinion, it’s really about – protecting our kids from some pretty scary stuff creeping around the park. here’s just one of my concerns – if these kids posing as gangsters are allowed to continue doing so, it will (and i believe already has) attract the attention of real gangsters. i’ll leave you to figure out where this situation likely leads…. BTW, The Scottish “kid” is not a juvenile and he did have drugs in his back pack. Just sayin’! A lawyer explained to me that the police are legally allowed to lie to me, but If I lie to them, I can be charged with lying to﻿ police. The hypocrisy and arrogance of this is astounding. Because of this dishonest policy by the police, whenever there is a news story that says the police need help or information, or that an officer has been shot, I just assume they are lying again and disregard the whole thing. It’s a shame the police have destroyed their own credibility by lying to people. You really have no clue how things work. A lawyer explained that to you because you had been arrested and were facing charges?? How about this: do not violate the law and then you will not be compelled to lie to the Police. Also, it is not entirely true that you can be arrested for telling a lie to the Police. In fact, in most instances your “lawyer” is wrong. You are quite right. They CAN legally lie to you. But you cannot legally give false information to them. If you get involved in a confrontation with the police, or they just casually approach you and say that they are wondering whether they could “ask you a few questions,” be courteous and respectful, address the police officer as “officer,” BUT…..
1. DECLINE. This often happens at a person’s doorstep, but it could happen anywhere. You don’t have to open your door to the police unless they have a warrant. If you do answer your door, don’t allow the police to enter your home. Close the door behind you and talk to them from your porch. 3. “Are you detaining me, or am I free to go?” They may search you anyway, but unless they have a warrant, the search is illegal and you can use this as leverage when it goes to court. DO NOT SAY ANYTHING ELSE TO THE POLICE, NO MATTER WHAT HAPPENS. Remember that there is no such thing as a “casual conversation” with the police. THE GIMLET EYE says, #4.”i’m going to remain silent” “Do not say anything else”. Wow follow that advice and enjoy your stay in jail without O.R. Hey T G Eye get it correct. If you don’t answer the questions while being booked no O.R.. Otherwise You wait in jail until you bail or see the judge. A good attorney should know the system better. You might want to adjust #4 a little. Just sayin…. Wow, eleven thumbs down on my above post. Besides Gimlet alot of you have never been booked into jail. If Gimlet won’t or doesn’t know let me try to explain it. If you get arrested you have the right to remain silent. The cop does not to have to read you your Miranda rights. (I know this will confound some of you) But he will fill out a booking page on you. Things like name and address. Not questions about why you were arrested. If you don’t answers those booking questions you won’t get O.R. (own recognizance)release. That means you either arraign bail or wait to see the judge. Attorneys say alot of things that are not right, but what do they care. you do the jail time not them. Atascadero cops are like pond scum in my eyes. I never had a personal run in with them but have witnessed various abuses of civil rights. Sounds like a pretty bold statement considering you’ve never had a personal interaction with them. I hope you change your mind the next time you need them to show up at your house.